That H28 sure has that 'antiqued' look about it. More work than it looks I'll bet. Canoe club xmas bash yesterday at a local 5th generation professional fishermans' place. He wasn't there, out fishing of Tassy's west coast in 20M swells. In his tiny creek was a Couta boat, restored but it was built by his great grandfather and used for 40 years by 2 generations to make their living. No pics, no camera but very simple and spartan. He has the original rig but no sails. 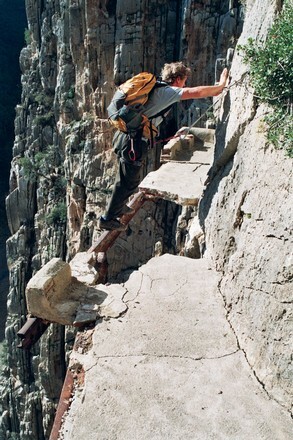 I would find the cracks in the concrete rather disturbing, not that walking on that rail isn't! There's a seriously hair raising clip on Utube about that walk . I'm sure he'll have his own video of it. I'm not linked in to any of my kids on Facestalk, so can't show his photos. and the more I look at her and read about her the better I like her myself, seems very nicely priced for what she has in and on her. Last edited by Larks; 12-15-2011 at 12:57 AM. Subject to her being sound that would have to be great value Greg. About the ideal size for one or two people to manage as well. As Rufus says ,if she surveys well she very nice indeed ! Wow! Wouldn't that be just about perfect for Rob? Seems very cheap. Greg also posted privately about that boat , and I gave him a detailed response. 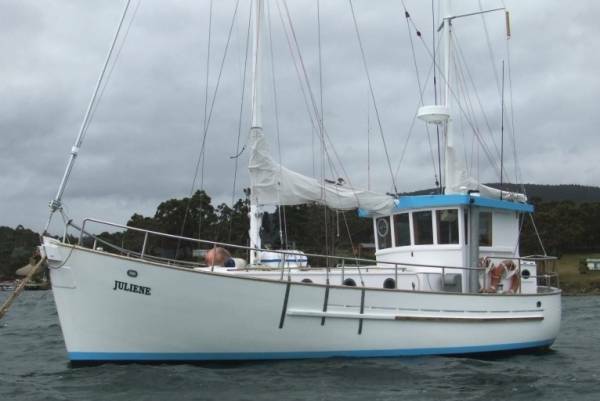 But basically , that boat was on the market when I first started looking , maybe 6 years or more ago. She was either taken off the market , or sold , but came back on the market maybe 2 years ago. If you look on the thread I have put up on the Aussie WBF , you will see I mentioned her ages back. I had intended checking her out when I went down to Tassie , but suddenly she was off the market , I assumed she had been sold. I contacted the 3 boat brokers , telling them I was coming down , and I was in the market for a 28-30 ft cray boat. The only broker that bothered to reply was BB of T , to tell me that they had a deceased estate coming up , a 30 footer , but that was all they could tell me at that stage. I asked them if it had been advertised with another broker , they assured me it hadn't. So , I went down , and checked out a few boats advertised privately , I checked out the boats all along the east coast and south , but got no advise from BB of T , till I got home. Then they told me about her . I've been following her for years , checking to see if she is still for sale , and when I've gone down there hoping to see her , they stuffed me around. I wasn't happy , and told them so !. But it was a very enlightening trip , and I made some very good contacts. 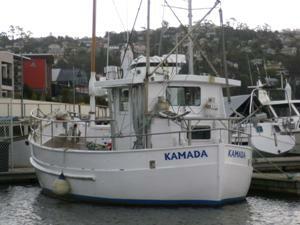 The biggest disappointment was that as I was coming in to LST , Kamada come on the market again. If I had known , I would have bought her. I didn't find out for a couple of days that she was on the market , by which time she had gone. 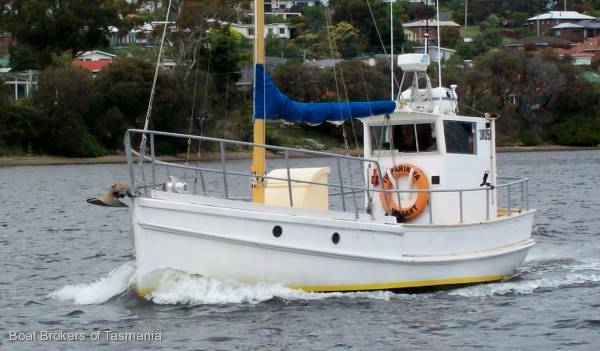 I saw a couple more Bernard Wilson boats , I would love to get a Kamada , or one of her sister ships.I saw one being prepared for new owners in Triabunna . Ya never know , I have a very good man on the lookout. 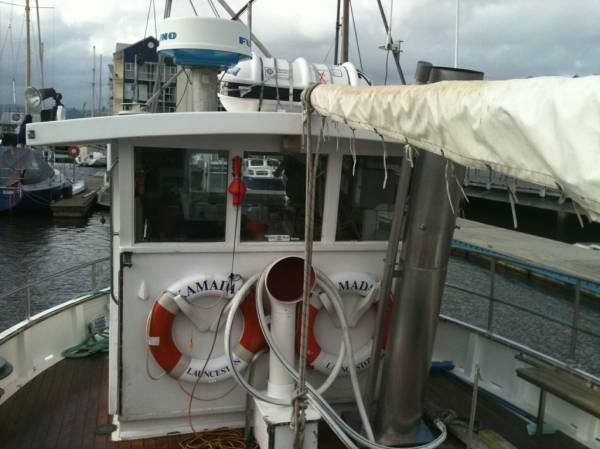 This boat for sale , bloody hell , they knew I was coming down , surely they could have organised me to try her out !. The previous broker told me she is NOT a motorsailer . Without trying her , I'm wondering if that is just a matter of definition , or interpretation. There are a couple of other possibilities too , that could develop further. 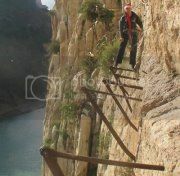 I posted a photo of the cliff walk in Spain that my son did the other day - but it wasn't him in the photo. I just stalked him and see that he's uploaded a photo of him doing it. Yes , she is quite a beamy boat Greg. When I was interested in her before , I had a long talk with the builder Kevin Argent , and the owner at that time , and AD actually went over her for me , and gave her the thumbs up. 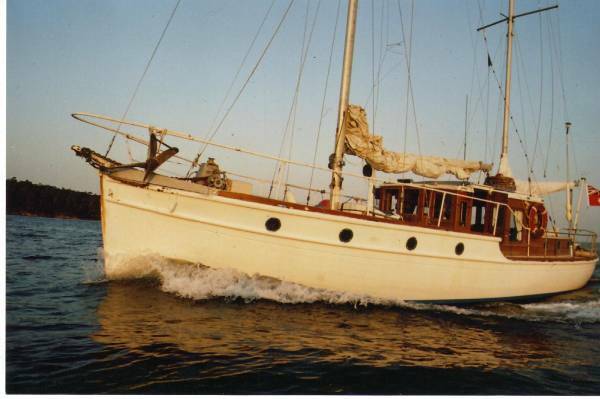 But Leyla baulked at spending $80,000 on my first up boat. She had a point , but the reality is , by the time I had finished doing up HS , I wasn't much shy of that anyway. I have a few photos of Kamada , from when she was for sale a couple of years ago , on my stupid site. Apparently , if she had a fault , it's that she was slow , being so beamy. But that is ok with me , I'm in no hurry. Seen this thing on Ebay Rob? Rick , no I hadn't seen that one. It looks like someone has spent a hell of a lot of time on that boat , and I've gone over the photos a lot , but I can't get enthused , I'm sorry. 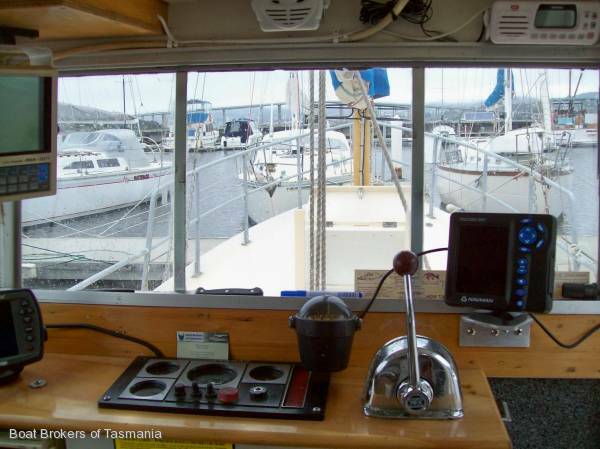 I'm looking for a flat deck if possible , and a wheelhouse , something like Bernard Wilsons own boat would be perfect !. Its a time and motion study , and you should be able to go all around the boat with your eyes closed. But thanks for posting Rick , she looks interesting , but not for me. I have to admit I don't like it either - but I thought I should mention it anyway. Thanks mate , for telling me about it anyway. What about this one Rob? Duncan she too has been on the market for some time , and I did enquire about her ages back , when the owner was asking well over $100,000 , as she ticked a lot of boxes. But I was advised that she needs a lot of work , and it would be big dollar work , so I stepped back from her. 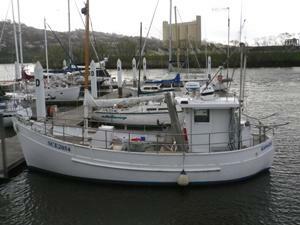 Its not only that the total cost would be so high , but it would mean a long time in a boat yard being worked on. I'm buying to use , not work on. The ideal is the Bernard Wilson boat . 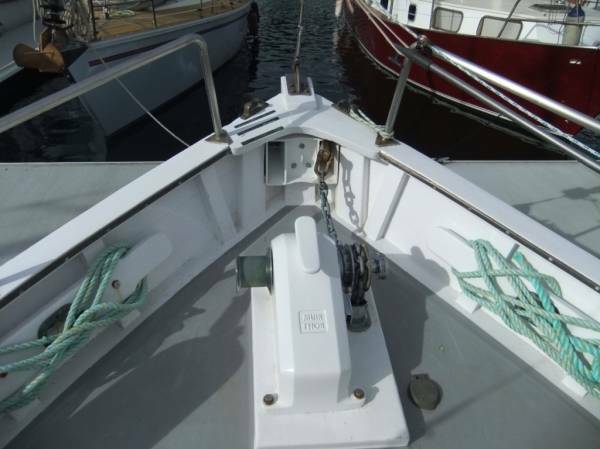 A headsail on a self furler , a gaff rig with lazy jacks and winch , easy for one person to operate safely. Oh , and Bernard has a 6cylinder B series Cummins in his boat too , so if you need HP , its there. Although I would prefer the 4LW in the boat you put up. That boat does like nice , but I was advised by someone who knew her to stay away from her , unless you had a very fat wallet. And , like on Bernards boat , I'd like a flat deck. Regards , and thanks Rob J. Beautiful boats Greg ! I love the cruiser stern on Kamada . Greg , yes , Juliene is probably the bench mark on the Aussie boats. She has it all , a Bernard Wilson double ender , a 5LW , the right deck , everything. They were asking a lot of money , and she was on the market for a long time , but after her exposure at the Hobart WBF , she sold. I spoke to the previous owner just after that , he was justifiably proud of her . Apparently going down to Tassie she really flew at one stage , the Bass Strait does that !. But to be honest , I think I prefer Kamada , I'm just going to be fishing/trolling , after all. She offers the basic accomodation , and would do the job well. But that is the style of boat I want , tough , practical , and Bernard made them. Just out of interest, anyone else use Firefox and have trouble seeing images from boatsonline? I can only see them if I use Explorer. 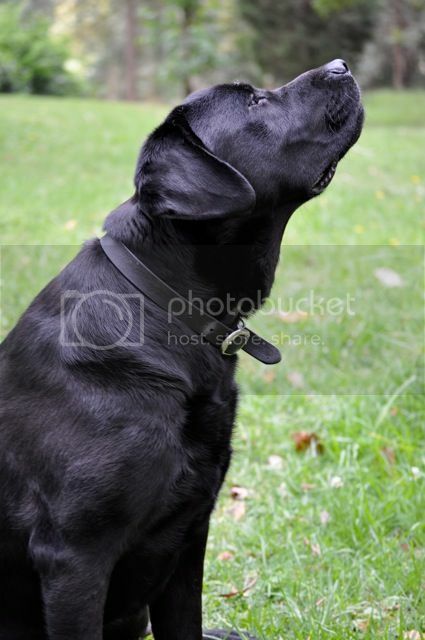 I use Firefox John, and I see images on that site. I havn't changed anything from the default settings in my setup. Perhaps Gary will be along to suggest something. I saw this image over on the Morgan thread. Does the bloke on the right resemble anyone you know? 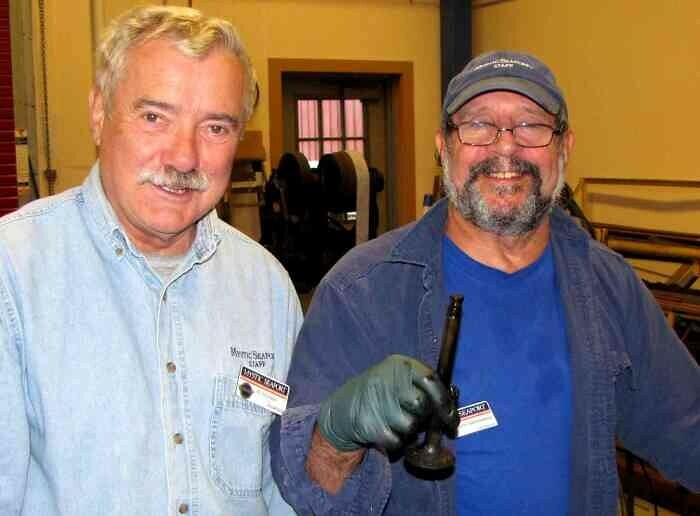 That's a very large valve he's fitting to a Morgan. Speaking of Morgans... I went past one near here the other day. A very sweet young thing was driving. I support your opinion of Kamala Rob, especially if you want a working boat, something you can fish from and not worry too much if she smells like a fishing boat occasionally .